and polytechnic colleges. The eligible candidates can fill the application forms online on or before 29-08-2018. Complete details regarding Punjab Public Services Lecturer Recruitment notification 2018 all the details are given below. 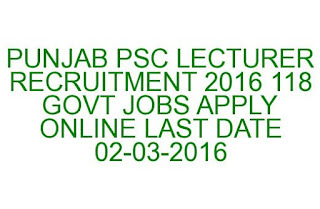 Click here to see the official notification of Punjab PSCLecturer Recruitment. 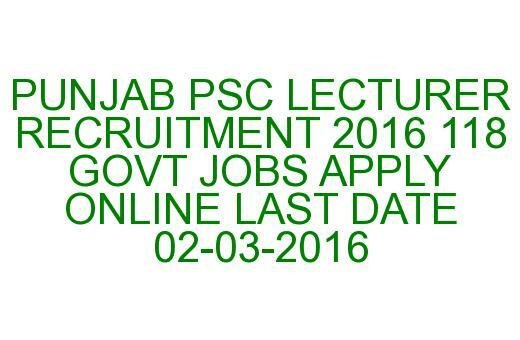 There are total 118 vacancies available in Punjab Public Service Commission of Lecturer jobs. The candidates who are applying for the any one of the above given post you must have qualified Masters Degree in the relevant subject with first class marks. The candidate must have studied Punjabi up to matriculation standard. As on 01-January-2018 the candidates of unreserved age limit is 18 to 37 years. For SC/ST/BC candidates age limits are 18 to 42 years. The selection for this Punjab PSC Recruitment will be held based on Competitive examination. The complete details of examination syllabus and pattern will be given in the official website of PPSC. Please see the candidate instructions for more details. The Pay Scale: Rs 15600-39100+5400 Grade Pay. For librarian Pay Scale: Rs 10300-34800+5000 Grade Pay. The online application form has to fill through the official portal of Punjab Public Service Commission. PPSC will never accept application through offline. The candidates must have read the official advertisement and User Instructions before applying online. The candidates has to register the candidates must have uploaded the latest color passport sixe photo and scanned signature. For more details please see the official notification. Click here to apply online for the recruitment of Punjab Public Service Commission Lecturer Recruitment 2018. Please share this article to your lovable friends through online social networking sites.